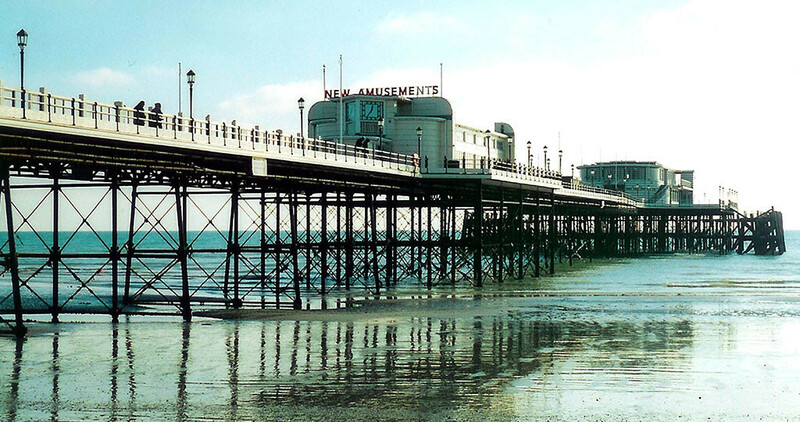 The Worthing Pier Company was formed in 1860 to build a 960 foot pier. Designed by Sir Robert Rawlinson, the first pile was driven on 4th July 1861, and the pier opened on April 12th 1862. 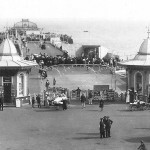 A band provided the first pier entertainment in 1874. In 1881, there were daily performances from the Rhine Band. The decking was widened in 1888/9 and a 650 foot ‘Southern’ pavilion was built at the pier-head. Two entrance kiosks were also added. Steamers could not call at low tide but proposals in 1900 to extend the pier were abandoned because the water would only be 6 foot deeper if the pier’s length was doubled. On Easter Monday 1913, the pier-head Southern Pavilion was isolated when the decking collapsed. 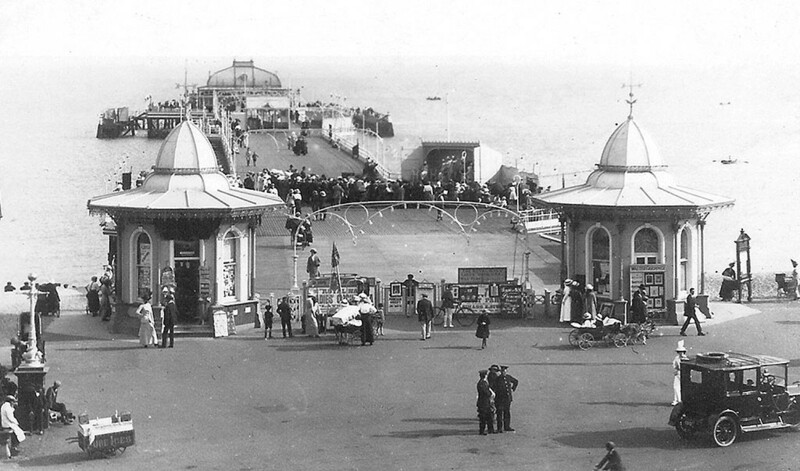 The pier was officially re-opened by the Lord Mayor of London on May 29th 1914. 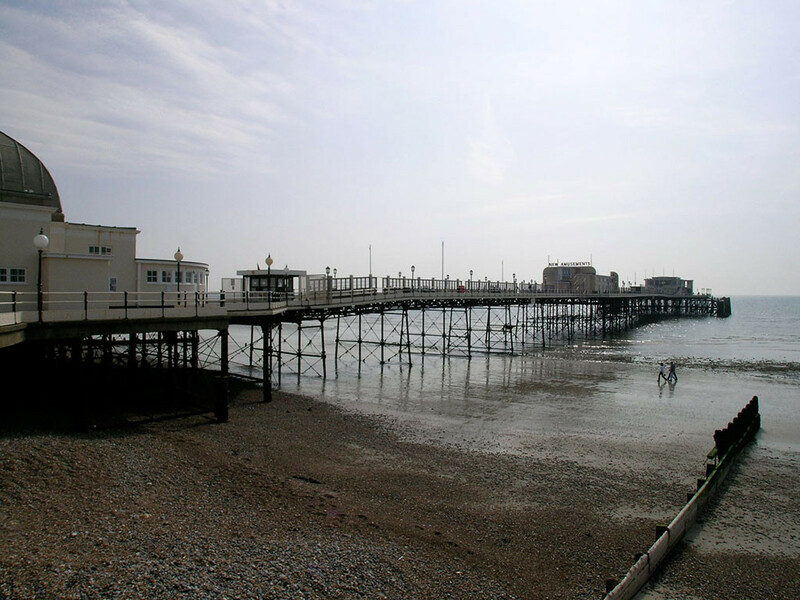 Worthing Corporation purchased the pier for £18,978 in 1920. £40,000 was spent on extensive repair work and a new shoreward end pavilion (designed by Adshead & Ramsey) was begun in 1925. The pavilion opened in June 1926. The Southern Pavilion was destroyed by fire on 10th September 1933 and replaced by an £18,000 structure in July 1935. An amusement pavilion opened in 1937. Steamer services were suspended in 1939 and the pier was sectioned in 1940 as a defence measure. By 1942, the shoreward end pavilion was a troop recreation centre. It re-opened in June 1946, but a shortage of steel meant that the rest of the pier remained closed until April 1949. Steamer services restarted shortly afterwards and PS Waverley and MV Balmoral still call regularly. In March 1958, the shoreward end pavilion received a £9,000 facelift and, in 1959, the Denton Lounge was added. Between March 1979 and April 1982 the shoreward end pavilion was re-developed as an entertainment centre and houses pop and classical concerts. 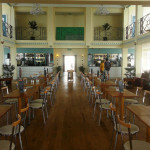 A nightclub was opened in the Southern Pavilion at the seaward end in 2007. It was later closed because of violence and under-age drinking. Since 2008, Worthing Pier has been the home of the annual International Birdman competition, which moved to the pier after it could no longer safely be held on the pier at Bognor Regis. In 2009, in recognition of its importance to local tourism, West Sussex County Council doubled its funding for the event to £10,000. An estimated 20,000 people watched the Birdman event over the two days. The 2010 competition was estimated to have attracted 25,000 visitors to the town. The competition continued in 2011, although temporarily delayed by strong winds on the first day. 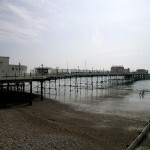 In October 2009, the End of the Pier International Film Festival moved to Worthing from Bognor. Then in November 2009, two kite surfers leapt over the pier in a spectacular though highly dangerous stunt. March 2011 saw crowds of people on Worthing Pier to watch the procession of a giant, man-made “conga eel”. Later there was a performance from a live band. The activities were held as part of the Party on the Pier event to mark the launch of British Tourism Week, from March 12th to 20th. 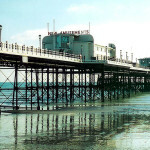 In June 2011, the police appealed against a decision by the local council to permit the nightclub on the pier to re-open. There had been strong local objections to the decision and the police felt that the council’s decision was not in the public interest. In April 2012, despite heavy April showers, hundreds of people gathered to celebrate the pier’s 150th anniversary. The celebrations included a gospel choir, bubble blowing flashmob, cake cutting and picnic attended by local dignitaries. 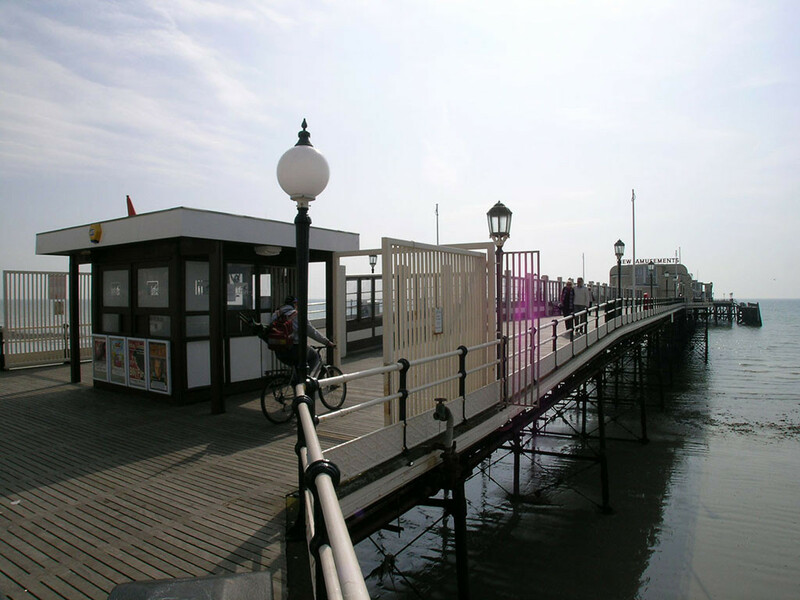 August 2012 saw another very successful Birdman Competion off the pier and also in August, the lease on the pier’s Southern Pavilion expired and a new party was sought to take over its management. However, the Pavilion was still empty by February 2013 and the council announced an intensive marketing campign to find a new lessee. 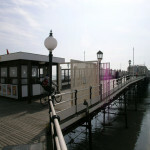 A number of unsuccessful applications were made to take over the running of the Pavilion, including a toy museum and a mixed-use arts centre and cafe and some local business people stated that the pier itself needed new attractions in order to encourage people to visit the town. Then in July 2013 it was announced that local businessman Phillip Duckett could be the preferred bidder with his plans to transform the building from a nightclub into a “multi-purpose venue”. It was hoped that planning permission, listed building consent, premises license and building regulations approval would be granted so that the building could be up and running by Spring 2014. August 2013 once again saw a very successful Birdman Rally for human powered flying machines. 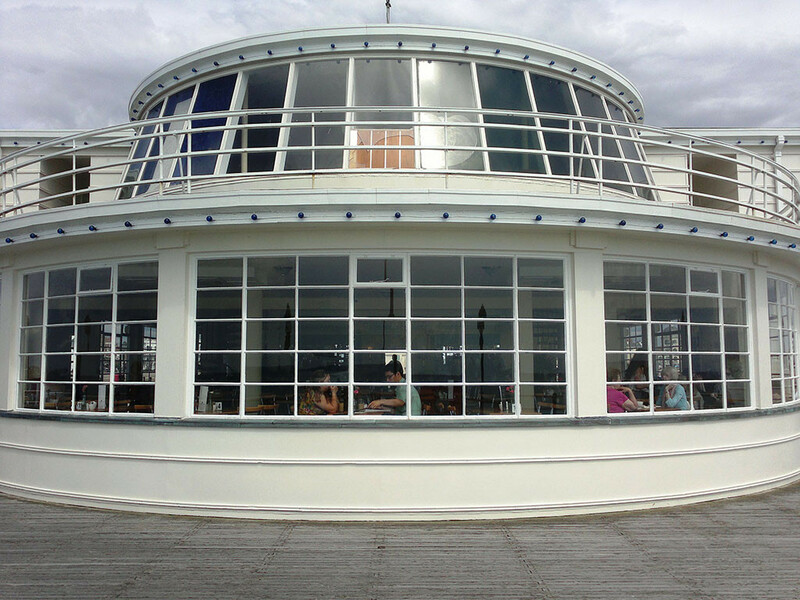 And in September 2013, businessman Phillip Duckett was announced as the local authority’s preferred bidder to transform the Grade II listed 1930s art deco Southern Pavilion building into a venue for weddings, conferences, and private parties, and including a restaurant and tea rooms. The refurbished Pavilion was finally opened in April 2014 to wide acclaim. It was described as a ‘light-filled, glorious open space’, with everything from the air conditioning to the sweeping oak flooring, having been carried out by local companies. 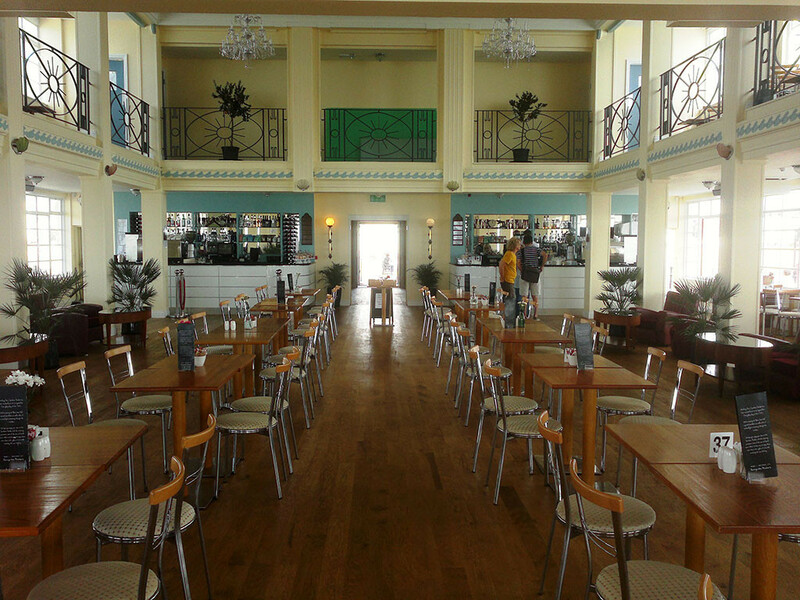 The restored Pavilion now provided Worthing with an excellent venue, with outstanding 360-degree sea views, and a tasteful art deco look, reflecting the building’s history. A unique outdoor gallery featuring the work of 100 local artists with 40 panels dedicated to the WW1 Centenary was setup in May 2014 on the pier. The gallery was the brainchild of Vanessa Breen, 42, and Nadia Chalk, 45, the team behind community interest company Creative Waves, providing art in the community. In July 2014 at Worthing International Birdman competition, the record for the furthest unassisted flight was broken by Ron Freeman who flew 159.8m (524ft) breaking his own record at the previous year’s event. The Pavilion welcomed over 90,000 visitors in its first year and held a variety of events from award ceremonies to weddings. A fire at the pier in June was tackled by firefighters from West Sussex Fire and Rescue service who took 90 minutes to put the fire out. Minor damage was caused to the Southern Pavilion. The annual Worthing Birdman Competition held in August 2015 was won by Tony Hughes, a former hang-gliding champion, at a distance of just over 106m (347ft). Worthing Pier wins Pier Of The Year 2019! 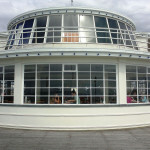 Worthing’s seaside heritage celebrated at Worthing Pier!